Join us on a trek through the deserts of Jordan to reach the iconic ancient city of Petra, one of the modern Seven Wonders of the World. We’ll follow ancient trails through enchanted country which the nomadic Bedouin people and their livestock have travelled for generations. To get there we’ll trek over dry wadis and through lush canyons, open sandy desert and rocky hamada. You’ll encounter hot springs, Roman remains, crusader castles, Neolithic houses and green valleys fed by crystal streams. The scenery is absolutely mesmerising with the canyons and gorges coming alive under the changing light and glowing in various shades of red and orange. At night, we camp in Bedouin tents and feast by the campfire as the desert sky opens up to the stars. Entering the incredible city of Petra is the highlight of the expedition – the ancient capital of the Nabateans, age unknown but ‘half as old as time’, seems impossibly carved from the rock face. As a special extra we can visit Petra at night when it is beautifully lit by candlelight. The special treats do not stop there. We have also added an incredible days trekking on camel back through the famous and stunning Wadi Rum before a night of glamping in the middle of the sand and mountains. On our last day we head to the Dead Sea to soak our weary feet at our spa resort and relax in the unique buoyancy of the waters. Let your incredibly knowledgeable Bedouin and western guides take care of all the logistics and safety while you immerse yourself into this totally unique desert experience. In aid of the Chiltern Centre. You will be met on arrival at the airport and transferred to a hotel in Amman. After breakfast, we drive in air-conditioned comfort down the King’s Way to Mount Nebo. This 1,000m mountain is a very important Christian site, for it was here, on the edge of a ridge overlooking the Dead Sea, that Moses first caught sight of the Holy Land, having led his people from Sinai. It is said that he also died and was buried here. Mount Nebo offers fantastic views of the Jordan valley and the Dead Sea, with the West Bank city of Jericho usually visible from the summit and Jerusalem apparent on very clear days. We take lunch near the imposing Crusader castle of Kerak. This is the largest and best-preserved of the Crusader Castles in the region. It was built in 1132 by Baldwin of Jerusalem and sits on top of a steep outcrop, an almost impregnable position. It became famous at the time of the Crusades as one of the chain of fortresses used in the Holy War against Islam. We continue driving south enjoying the fantastic views over magnificent Wadi Araba before briefly stretching our legs at Shoubak Castle. We arrive at Mansura where our campsite awaits us. 4.5 hour transfer. Today we trek along the Shara mountains. The barren landscape suddenly changes as we enter Wadi Daphna with its hot springs and palm trees. We follow this stunning canyon from beginning to end, jumping into deep blue pools and scrambling up and down boulders. Late afternoon we emerge in a broad valley passing palms, reeds and oleander bushes that blossom in the spring. The Wadi Feinan gorge has an interesting archaeological landscape and was an area rich in prehistoric activity. During our walk we will see the remains of a late Roman citadel, copper mines, elaborate water systems and settlements with Neolithic houses, in places preserved to two storeys before we reach our campsite for the night. Our trek follows the outskirts of the Shara Mountains and through the Wadi Araba, which is like a small rocky desert called a Hamada with scattered Acacia trees. From a small Bedouin settlement we will barter for a goat and our local Bedouin crew will expertly prepare and barbeque this over an open fire for us tonight. There are several small hilltops to climb for an unforgettable sunset over the desert plains on which we are camping. We hike into Wadi Feith, a narrow canyon with its year round running stream, and then turn down into Wadi Sahawa. The trail then heads up to our lunch spot at Tabqa Agla. After lunch we take a Bedouin trail with beautiful views over Wadi Araba to Gabural Al Waheidat. Tonight’s camp is on a spectacular pass from which we can see the whole of the route we climbed so far. We hike down into a fertile valley before ascending an exposed ridge-top. The climb is short but steep and the views from the top are breathtaking. We are more than a kilometre above the desert plains below. After lunch we climb down through a wild valley and past sandstone domes and cliffs to little Petra, giving us our first taste of amazing Nabataean culture. We also take some time to visit the Neolithic village of al-Baidah before we reach our camp at El Maisra near little Petra. A short transfer to our campsite is available after our Bedouin crew have made our afternoon tea. For the purists the trail continues another 2 hours along the gravel road, winding its way through the sandstone domes to camp. For many today has proven the most spectacular day. Tonight is our last night sleeping in the Bedouin tents or under the open sky. Today we continue our trek to Petra. We enter the little Petra reserve and negotiate narrow paths clinging to the side of deep canyons. We have a whole day to enjoy Petra including a halfday guided tour of the rose-red city which is one of the New Seven Wonders of the World. Petra was carved into the Sharah mountains by the industrious Nabataeans, who grew rich through their control of the frankincense trade routes through Arabia. 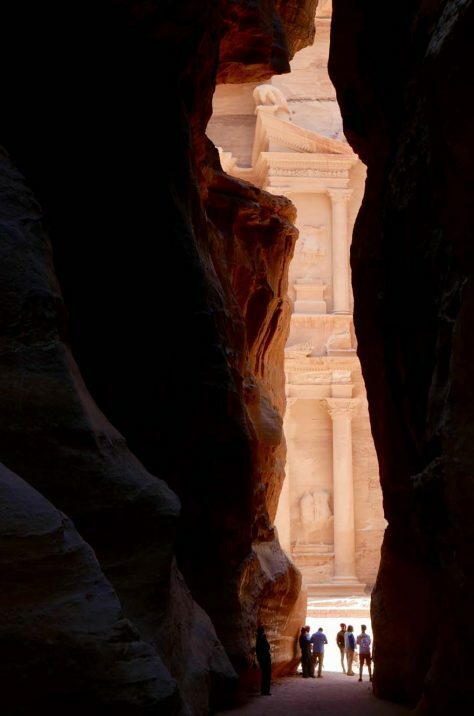 Petra fell into obscurity about a thousand years ago, while its existence, and location, were kept a closely guarded secret by the local Bedouin, until 1812 when the Swiss explorer John Louis Burckhardt tricked his way into the site. Our guided tour of this unique and unforgettable site starts with a walk through the Siq, the narrow and winding fissure between towering cliffs, which we exit through a tiny cleft to be confronted by the awe-inspiring splendour of the Treasury monument, Petra’s most elaborate ruin, hewn into the sandstone rock. Local legend has it that this tomb once stored the gifts of the Queen of Sheba to Solomon. We progress to explore the royal tombs, a roman theatre and the colonnaded street to name but a few of the astounding attractions on view. We will also walk up the 800 steps to view the vast and impressive Monastery (Ed Deir), which enjoys fabulous views over the whole area and a mountain atmosphere. After lunch, which we will have on site, the afternoon is free to explore one of the most impressive and exciting sites of ancient history anywhere in the world. One option is to walk up to the High Place (Attuf Ridge), once the venue for sacrificial offerings, which gives wonderful views over the Petra Basin and out towards Jebel Harun and Wadi Sabra. We celebrate the successful conclusion of our trek with an early dinner before we head back out at about 8pm to have a wonderful experience of visiting Petra by night, which for many is a really spectacular experience. After having visited Petra by candlelight we come back to our comfortable hotel room in Petra. Transfer from the hotel in Petra to Wadi Rum. Upon arrival at Rum’s protected area, we find our camels and begin our 4 -5 hour camel ride to Lawrence spring and Khazaali famous canyon. Here we will have a delicious picnic lunch before we continue with the camels heading to Lawrence house, the sand dunes, and coloured cliffs. Before sunset, we will be picked up by jeep and transfer to a deluxe campsite still in the heart of the desert where you will be able to enjoy the dipping of the sun before dinner. The campsite is very special, and each tent has its own private tented bathroom. This will be a day and night to remember. Today we transfer to the Dead Sea and check in at Dead Sea Spa Resort before you have a free afternoon. Think mud baths floating on the sea and massages. Dinner and overnight in the bungalows at the 5-star Resort. A day to fully relax and enjoy the Dead Sea Spa Resort. If you prefer to spend this free day shopping instead there is a mall within 5 minutes walk of the hotel where you are able to buy souvenirs at a very reasonable price! You are also free to organise and visit the site of St John the Baptist and be within 10 feet of Israel that lies just over the Jordan River. A large taxi is in the region of 70JD. (for 8 persons). Please allow a few hours for this extra visit and arrange the taxi with the hotel to come and wait with you. For roasting over the campfire at the end of the day. You can’t buy marshmallows in Jordan, so don’t forget to bring some with you! Our guides are the best in the business. They know the environment you will be trekking through intimately and hold the highest leadership and first aid qualifications to lead groups in remote places. Furthermore they have worked with the local crews for years and established a fantastic working relationship with them. Many speak several languages and they have operated many individual expeditions in the very environment in which you will be trekking to ensure that their enthusiasm never wains. We handpick our leaders for their extensive expedition experience, their leadership skills, and for their ability to relate to the local people with whom they work. Additionally they are supported by our fabulous local Bedouin guides whose knowledge of the local area is quite extraordinary. The 360 team will meet you at the airport. We will let you know where and when nearer the time of departure. What is the food like on this trek? At the hotel we will be served with an open buffet with several kinds of hot dishes, salads and desserts for dinner. During the trek breakfast will include jams, pitta bread, cheese, teas and coffees, orange juice etc. while our lunch boxes will be classically Jordanian with pitta bread and hummus, mineral water etc. Our dinners will be a nightly open buffet with one kind of hot dish (comprised of meat) a soup, four kinds of salads and dessert with tea and coffee served at safari tables around a fire. We will be drinking bottled mineral water for the duration of the trip. We have plenty of bottled mineral water that we serve with breakfast and you can take as much as you wish for the trekking sections. At night we put an ample amount of bottled mineral water near the open buffet so there is plenty of access to fresh water. Where will we be sleeping whilst trekking? We will be staying in traditional Bedouin tents. They are big communal handmade cloth tents. You won’t have individual tents. You will also be able to sleep under the stars. The camps will be set up each day by the support team before you arrive. They are not fixed camps and are set up each day for our specially designed itinerary. What are the hygiene facilities in the desert? Washing will be predominantly wet wipe washes – there is sometimes an option of a tent shower and there will always be a tent loo at camp. Will I meet the local Bedouins and have time to watch them cook and spend time with them in the evenings? Yes, you will have a chance to fully immerse yourself in the Bedouin culture. They are fascinating and friendly people and you will be lucky enough to have a chance to see into their lives first hand. What happens if there is a problem on the trek or if there is an emergency? Accidents can happen and anyone undertaking these adventures has to accept there is a degree of risk due to the very nature of the challenge. All our guides are in communication with each other by satellite phone and radio. Our local crew are all experienced in dealing with any problem that will arise. Our guides are either doctors or qualified to the highest standard of wilderness first aid and can handle any emergency with the highest level of competency. We have a four wheel drive vehicle that supports us by carrying the equipment and we are in constant communication with it should more serious problems arise. What vaccinations do I need for this trek? We advise you to check with your GP surgery or a travel clinic on latest advice about vaccinations and to ensure you are up-to-date. You advocate bringing a small first aid kit. What should it have in it? We advocate a little bit of self-help on the trek. If you have a blister developing for example then please stop take off your boot and treat it before it becomes a problem. Your own first aid kit should contain a basic blister kit, plasters, antiseptic, sun protection, your own personal medication (sometimes your porter might get to camp after you and if he is carrying your medication you may not be able to take it according to the regime you are used to), basic pain relief (paracetamol, aspirin and ibuprofen) a personal course of antibiotics if prone to illness etc. Foot powder in your socks every morning is great for preventing blisters. Generally the best approach to take when packing your first aid kit is to include such basic medications as if you would on a family or personal holiday. Your 360 expedition leader and/or a member of the local crew (we call the ambulance man!) carries a very comprehensive first aid kit which contains a wide range of supplies and medications. They are fully trained to use whatever is needed for any emergency that may arise We advocate keeping this in mind when packing your own first aid supplies and keeping your own FA kit as compact and light as possible. What equipment do I need for this trek? A comprehensive kit list is included in this pack. If you have any questions about any of the items on it, please do call the 360 office as we are happy to advise. We always have comfortable thick mats available since we can carry them in our jeeps so there is no need to bring your own. There will also be plenty of heavy rugs. It is best to bring your own sleeping bag which should have a rating of -10, as it can get very cold at night. You will need to bring trousers, shorts, t-shirts, several pairs of socks, jackets and some good sun protection by way of a hat and sunglasses. For footwear, you’ll need a good pair of well worn in boots to trek in, and a pair of sandals or light trainers to pad around the camps, and later Petra. What clothing is suitable for when we come back from the trek? When in Rome do as the Romans. Shorts and t-shirts are fine to wear during the course of the day. Evening wear generally tends to be casual: long trousers and casual shirt are fine for all hotels and restaurants. Jordanians are generally quite conservative in their dress code and are generally well dressed despite their situation in life. Remember that this is a Muslim country and in religious areas, women ought to cover their shoulders and legs at the very least. Fortunately, 4-wheel drives and mules will be the taking the strain for this trip! But pack no more than you would want to carry yourself: 15kg is the limit. Any extra weight such as spare clothes etc. can be left with our local crew before you head for trek. What advice do you have on travel bags? Duffel bags are ideal for this sort of trip. Whatever bag you go for make sure it is robust and has a large capacity. It is far better having a large capacity bag with extra room (after all air doesn’t weigh much) than having a bag too small and finding problems packing your kit. Even having a 100 litre plus duffel bag is not too large. How much should my daysack weigh? What size is adequate? Your day-to-day sack should weigh no more than 3 – 4 kg and a rucksack of around 30L capacity will more than suffice. This rucksack can be filled to the brim with extra stuff when checking in at the airport. It is important that this bag has an adjustable waist belt to transfer the weight of your daily load onto your hips and from here onto your legs so that your strongest muscles do most of the carrying. What happens during a typical trekking day? We will be woken up early each morning at around 6:30 am and given a basic but hearty breakfast. After breakfast we will pack up with the help of the Bedouin and 360 Guides and begin the first trek of the day for about 3 hours. A long and early lunch will be taken to avoid trekking during the hottest part of the day. We set off to walk again for another 3 hours or so and then we establish camp late afternoon for dinner and a well-deserved rest. Temperature on average will be around 22C by day and 5C at night. Do I need to book my own flights to Jordan? My passport runs out 3 months after the trek, is this going to be OK? Do I need a visa for Jordan? Although visas are compulsory for individual tourist entry into Jordan for all foreign nationals; as you are travelling as part of a recognised tourist group, this requirement is waived. How can I best train and prepare? Personal fitness is important for this trek, and we have included a training programme which should see you at peak fitness! If you are struggling from day one then you will not enjoy the rest of the trip. Physical preparation does not have to be Herculean: concentrate on cardio-vascular exercise during the week by taking short runs when time allows and try to spend at least 2 weekends a month going on long walks (a decent six hours or 12 miles) carrying a rucksack of around 5kg in a reasonably hilly environment. Not sure what 5kg is? Put 5 one litre bottles of water into it. This kind of regime will not only prepare your body for carrying minor loads but will harden your body against the big days on the trek itself. In addition it will help you break in your boots and get used to your equipment. How much spending money do we need? The amount of money you will need depends on how many items you wish to buy or how much you plan to drink when we are staying in hotels. As a basic rule of thumb £200 (approximately JOD180) should be more than adequate for any post expedition spending. Jordanian Dinars can be purchased in the UK before travel which may make it easier on arrival as you don’t need to change money. ATMs can sometimes be unreliable in Jordan. You may want to take more money than you think you will need, and change back any excess money on return. Our local crew work extremely hard to assure that your expedition runs well. While tipping is not compulsory, it is and always has been very much part of the culture. Regardless of that, once someone sees the hard work the crew provides and realises the small amount of money they get paid in relation to your own wealth, tipping will seem the least you can do to say thank you. As a guide we suggest each trekker tips around $100 USD (JOD75). The total group tip will then be shared out amongst the whole local team. Tipping the leader is entirely at your own discretion. What currency is used in Jordan? Jordan uses the Jordanian Dinar (as a loose guide 1.00 GBP = 1.2 JOD). However, you should keep an eye on the changing exchange rates. ATMs are widespread in more urban areas but don’t always offer the most favourable rates. When receiving local currency, always ask for small bills, as larger bills are hard to change in small towns or for small purchases. The best places to exchange money are normally foreign exchange bureaus, which are fast, have longer hours and often give slightly better rates than banks. Do not accept torn money as it will likely not be accepted. Is there mobile phone reception in the desert? There should be mobile reception at most of our camp sites but this cannot always be guaranteed in the desert. Do we need a travel adapter for the plug sockets in the hotel or are they the same as the UK? No need to bring travel adapters as Jordan operates on the same system as the UK. How do I avoid getting sand in my camera and phone in the desert? We’re in the desert, there is dust and sand all around us, even in the air, and the last thing you want is for your camera to pack up half way through the trek so you need to take care of it. For things that will stay in your kit bag most of the time like (hopefully) your mobile phone, hermetically sealing food bags or stuff sacs will be fine for the duration of the trek and are cheap to buy. For kit that will come out more often like a camera, consider small rolltop waterproof bags from OverBoard (English) Ortlieb (German). If you go the whole hog and think about buying a Peli Case or similar, remember these are quite expensive, as well as quite heavy and cumbersome depending upon the size, although very good. Prevention is better than cure in many cases: take a soft, small cleaning brush or air blaster to dust off your camera at the end of each day, or should you accidently drop it in the sand. Remember to take great care when wiping or dusting the lens – blow surface dust off first before polishing it otherwise you’ll end up scratching the lens. If you’re using an SLR, try to avoid changing lenses out in the open, wait until you get out of airborne dust and sand, and keep the lens cap on whenever you’re not using it. While we will do everything we can to provide adequate safety for the group and security for your possessions, the general rule is that if you don’t need it, don’t bring it. This includes jewellery, necklaces, rings and even watches. Your passport and money should be kept on you at all times. As with travel in any foreign country, you need to look after yourself and your possessions and be aware of your surroundings, and this is no different. The trekking was harder and hotter than I expected, but all the better for it. Each day was different and magical in it’s own way with Petra as the grand finale.